Being a parent has changed me in more ways than one. I’m not what one would call an attention seeker-speaking in public is one of my greatest phobias but put my offspring centre stage and suddenly I’m an attention seeking diva of almost Kardashian style proportions on her behalf. I realised this last week when Mini and I were invited to the launch of the programme for this years Baboró Festival and there was a gaggle of photographers on hand to snap away as the babies got to meet some of the many talented performers who will be descending upon the streets of Galway in a little under a month’s time. I found myself mentally willing the cameras in the direction of my daughter at all times! And when they did veer away to capture some of the other adorable kiddies, I found myself harbouring some rather unpleasant thoughts towards them. I think I now know how those crazy American soccer moms feel like! A little about Baboró- the festival is in it’s 16th year and is a real gem in Galway’s glittering festival season. It’s an International Children’s Festival and as such features world class children’s entertainers from all around the world, showcasing dance, music, puppetry, theatre, art and poetry for little people. It’s on from the 15th-22nd October at various venues around Galway. 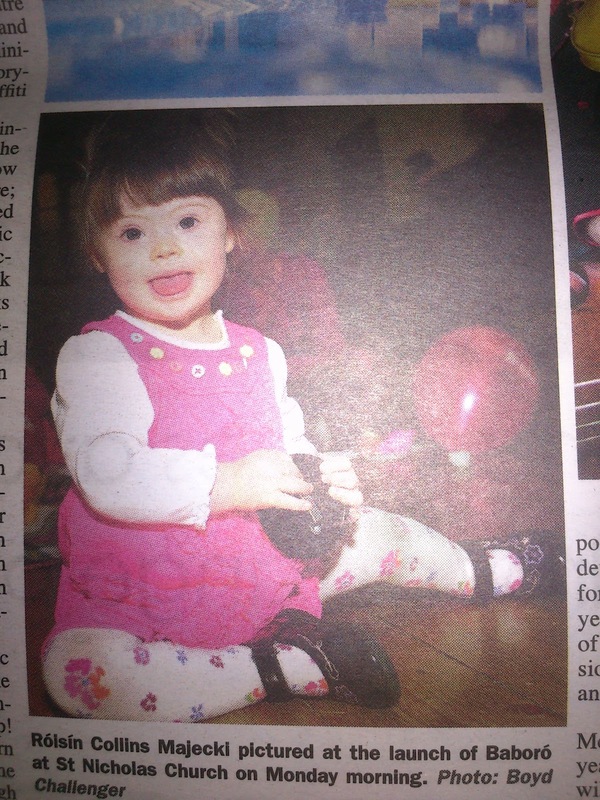 Check out their website here- www.baboro.ie Meanwhile, here’s my little star performer as featured in the Galway Independent. Of course you want the cameras to be on her, shes gorgeous! The festival sounds like a lot of fun for children. Belfast has one every year and mine love it. Thanks. The festival is great. Would love to check out the one in Belfast-I've still never made it there-it's always high up on my list of cities to visit.